Solar’s time has (nearly) come in the Middle East: natural potential is high, and given the right policy environment, clean energy can thrive. But national governments must stop subsidizing fossil fuels and instead invest in solar power. Mike Munsell of Greentech Media takes a look at Saudi Arabia, Jordan, Oman and more. According to GTM Research’s new Global Solar Market Attractiveness Index, the region is home to some of the most attractive markets for new-build solar in the world, and a steady stream of internationally competitive tenders — including more than 8 gigawatts expected in 2018 — has created a sizable pipeline of utility-scale projects in the Gulf, driven prices to record lows and caught the attention of the world. GTM Research expects that Saudi Arabia, Bahrain, Jordan, Oman and the United Arab Emirates will collectively install more than 22.4 gigawatts of cumulative capacity by 2023, all exceeding their renewable energy targets using competitive reverse auctions for utility-scale projects. But to date, most of the region has not seen the maturation of solar markets behind the meter, despite steep cost declines and the introduction or development of net metering policies. To understand the competitiveness and bankability of solar in subsidized retail price environments, GTM Research has partnered with the Saudi Arabia Solar Industry Association, Blue Horizon Energy and Global Energy Analytics on a new report that estimates the maximum installed cost ceiling for solar PV to be cost-competitive with grid electricity by market and segment. For decades, national governments in the Middle East have heavily subsidized domestic fuel and electricity prices with the stated purpose of promoting economic growth and providing a social safety net through the surplus distribution of nationalized oil production. Domestic energy subsidies have long been observed to distort markets, inefficiently reallocate benefits, depress foreign investment, drive overconsumption due to artificially low price signals, and create macroeconomic challenges for petrostates. According to the International Monetary Fund, in the five markets analyzed in the report, fuel subsidies total nearly USD $150 billion in 2015, with Saudi Arabian outlays representing 72 percent of this total. In these focus markets, some estimates suggest that retail electricity subsidies ranged from 54 percent to 98 percent for residential electricity and from 16 percent to 96 percent for commercial electricity. Non-cost-reflective retail tariffs result in a misalignment of incentives for solar development because the cost of offset energy decreases as the cost of solar decreases, according to GTM Research Solar Analyst Ben Attia. 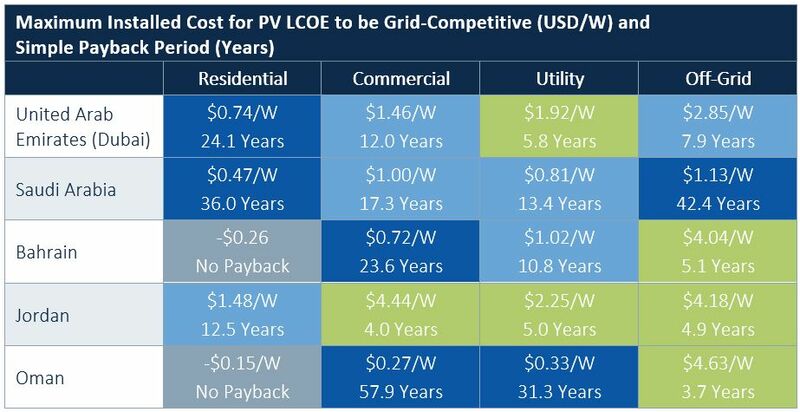 Because behind-the-meter solar is competing against artificially low residential and commercial tariffs, these tariff structures therefore offer a disincentive to developing behind-the-meter distributed solar. The recent fall in oil prices has caused several regional oil-producing governments to rethink their public subsidy programs and move toward rewriting their social contracts, cracking open the door for residential and commercial solar developers. The report found that at average market installation costs, there are no highly attractive markets for residential solar PV development in the spotlight countries, and that only commercial-scale solar in Jordan and utility-scale solar in Dubai and Jordan are attractive investments with current retail subsidies. Additionally, captive PV generation may offer more competitive pricing than the grid in Bahrain, Jordan and Oman. “These findings suggest that without below-market installation costs, accelerated phase-out of retail subsidies, or a comparable incentive program to level the playing field, it is unlikely that distributed generation solar will command a significant share of demand in markets where one-off utility-scale tenders dominate, creating a contracted project pipeline but little in the way of an underlying market ecosystem,” said Aaron Morrow, managing partner of Global Energy Analytics. In addition to the REEEF, provisions in the country’s energy transition law have led to a clean energy market that saw over USD $2.5 billion in investment between 2012 and 2016. This article has been republished from GreenTech Media.